I apologize for having disappeared for a while, I was a busy bee studying for my MCAT retake, then with MIT's senior week, and finally with graduation this past Friday. The good news though is that I accrued many pictures of food, friends, and sights during the past few weeks. So enjoy while I slowly update highlights from where I left off. I would like to get everything up to speed before I become more backed up. I will try and group things together into certain periods of time. (5/26) Continuing from where we last left off… at our dinner party that my mom cooked up tons of food for, one of the guests brought us a box of mini desserts from the local wholesale club. 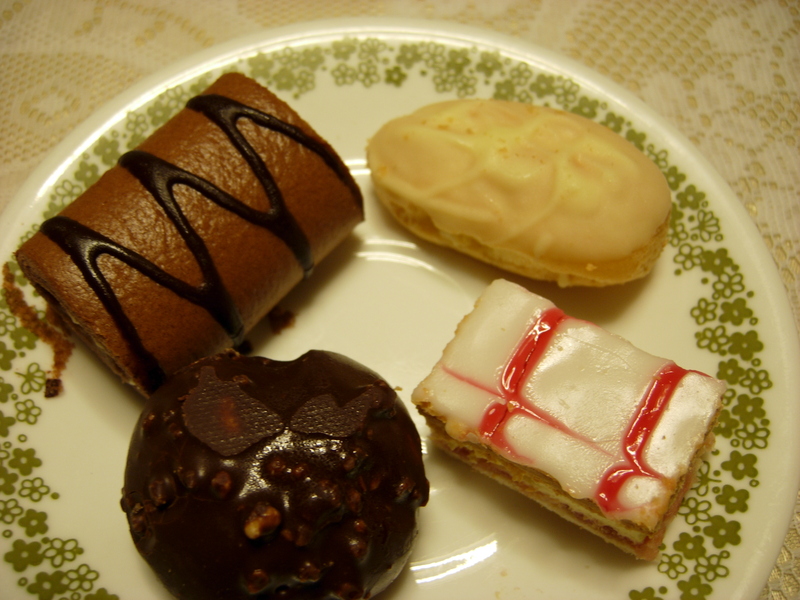 There were four different dessert types in the box: chocolate swiss rolls, white chocolate mini eclairs, chocolate hazelnut cream puffs, and strawberry vanilla napoleons. I of course had to try some of them that very night… :) I think my favorite was the white chocolate eclair, which doesn't look too impressive but tastes dreamy (it's the upper right dessert). White chocolate is actually one of my favorite flavors, and the eclair was topped with white chocolate, filled with bavarian cream, so the combination was very elegant and pleasing. I prefer it very much over regular chocolate topped eclairs that are filled with Boston cream. The chocolate hazelnut cream puffs were also quite interesting. The outer surface is covered with a layer of chocolate studded with toffee bits (oh yum! ), and inside the puff itself was a light chocolate mousse. (5/28) Several days later while I was taking one full length practice MCAT after another, I decided that I really needed a break. My comfort activity whenever I come home is to bake or to cook. But I didn't have the time or the energy to go in search of an interesting recipe to try, nor did I want to spend a whole afternoon in the kitchen. I was digging around in our pantry when I found an oven mitt with a package of brownie mix stuffed inside of it and a ribbon tied around the whole thing. It was one of those gift items that you can give to your friends. I asked my mom if she was keeping it for a gift later, and she said she bought it because it looked cute and told me I was free to use the brownie mix. So off I went, and it was a rather interesting brownie mix compared to the others I've made before from Duncan Hines and Betty Crocker types. All I needed to add was an egg, a stick of butter, and a few tablespoons of water. But due to the utter lack of liquid called for, the batter became a big doughy mass, very stick and very heavy. The directions then said to spread the batter out into a square pan, which I did with much trouble. It didn't pour out like other brownie batters. I literally was pressing it into the pan as if it were semi-hardened playdough. Finally though, I stuck it in the oven, and they came out as thin, fudgey, chewy brownies that my whole family adored. There was a lovely vanilla flavor that really stood out, which I preferred over the heavy and forced chocolate flavor that some other brand name boxed mixes offer. Now I only wish I knew the ingredients in the mix that made such a unique brownie! 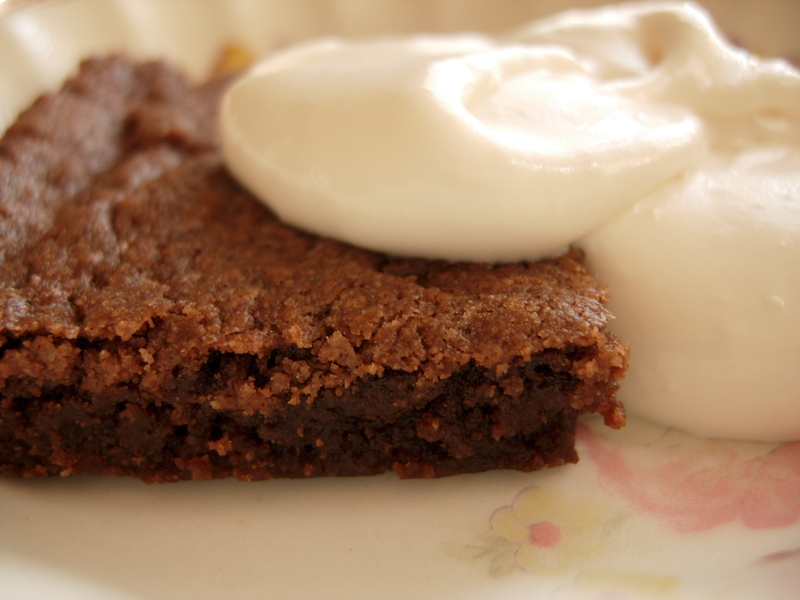 I was initially worried that the brownies would be too sweet on their own, since my family is not big on sweet desserts. So I wanted to make some whipped cream that could go on the side to lighten things up. Unfortunately, we never have heavy cream waiting for me in the fridge when I come home, because my family doesn't use it for anything. I did however, discover that our big container of non-dairy coffee creamer claimed to be "so rich that it whips! ", and it even included a recipe for how to make whipped cream from the coffee creamer. All it needed was 2 parts coffee creamer powder to 1 part cold milk, with sugar and vanilla to taste, then beaten for 5-7 minutes. It was easy to blend the cold milk and creamer powder, but once I had it going, it was quite difficult to get a firmer consistency in the cream, which was never quite like the whipped cream I could make with heavy cream. I also had to keep setting it in the fridge to cool down before continuing to beat, since 5-7 minutes on the counter really heated things up more than I would have liked. The end result tasted rich and creamy (but not refreshing like the real thing), and lacked the ability to hold any shape of its own because it was too soft. It went well with the brownies though, even though I'm sure everyone thought it was weird that I was serving brownies with whipped cream haha. (5/29) I was getting bored of making breakfasts out of oatmeal and milk, so I decided to have some jazzed up toast. 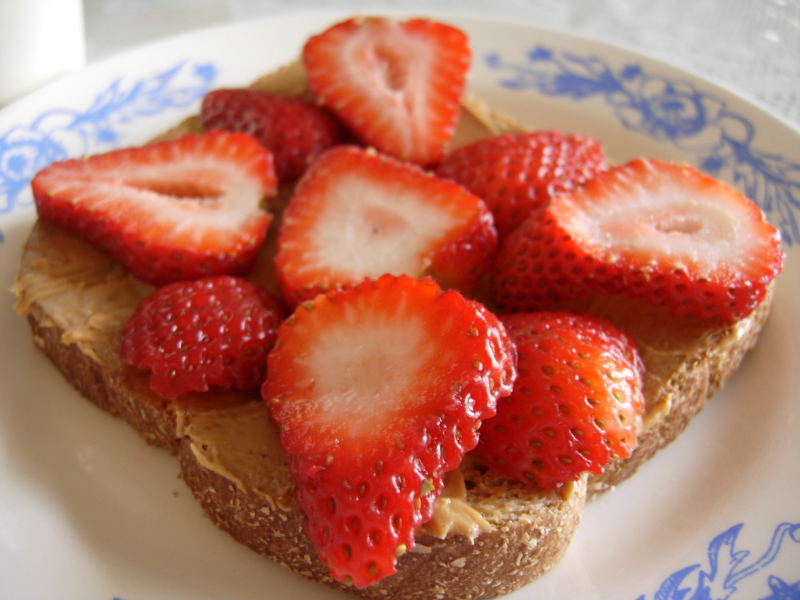 I lightly toasted the whole grain bread in the house, and for a few days I tried spreading peanut butter on it and topping with various fruits, all of which I enjoyed. I started off with banana slices, then moved onto strawberries, and finally kiwis. I must say they were all amazing, and the different flavors made breakfast so much more interesting. It was also a healthy and hearty breakfast that kept me full until lunchtime, and I'm sure it was great food for keeping me energetic while studying for my MCATs. 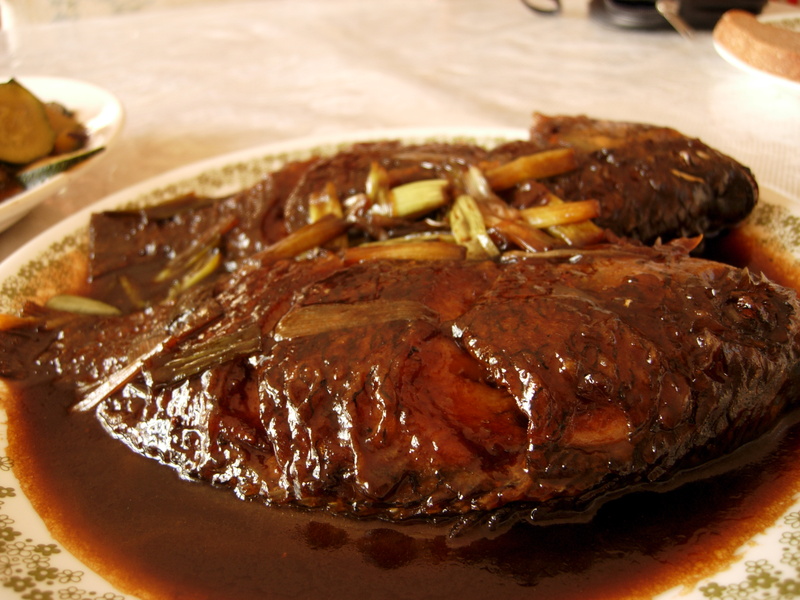 That night for dinner my mom was in a rush and what do Chinese people cook when they have no time? Fried rice of course! Haha my mom can whip up fried rice in like 15 minutes flat I swear, and it would take me like an hour. 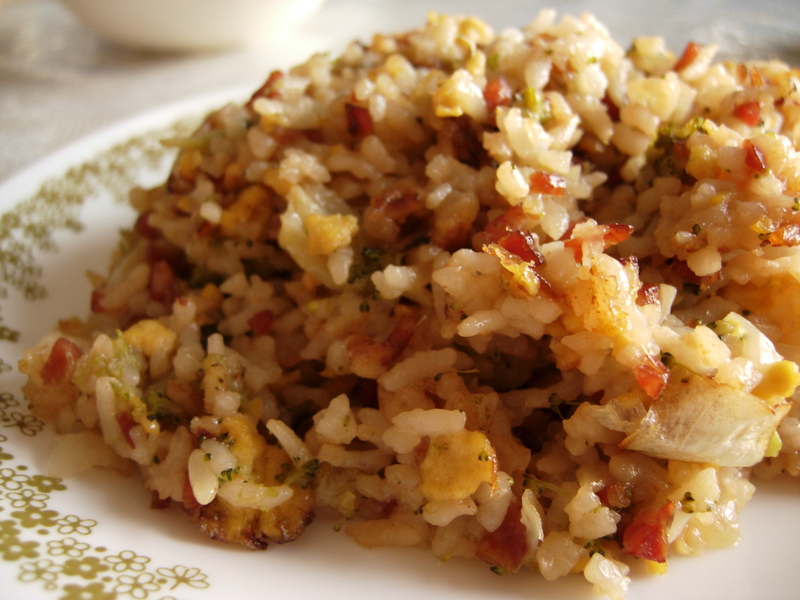 Today she made a simple fried rice with Chinese sausage, egg, broccoli bits, and onions. 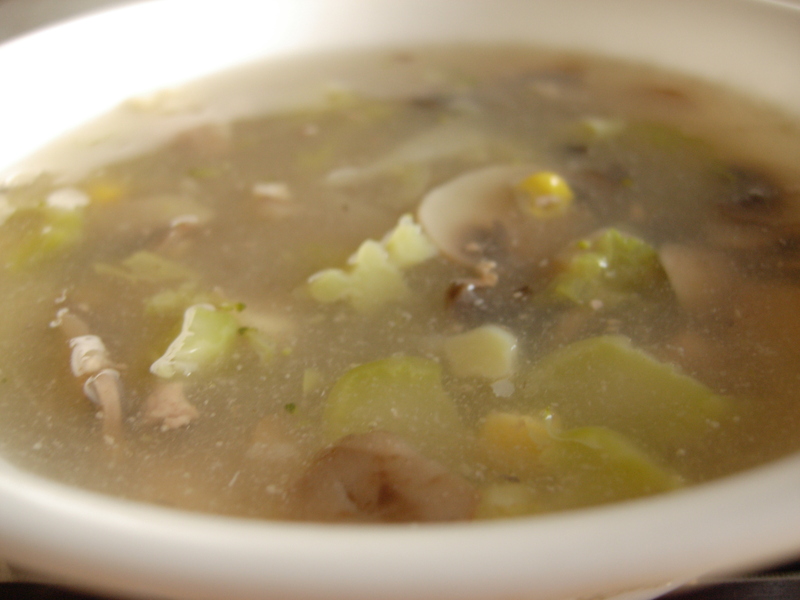 She served it with a soup on the side made with broccoli stems, mushrooms, and corn. They went very well together and it was a quick and easy dinner. 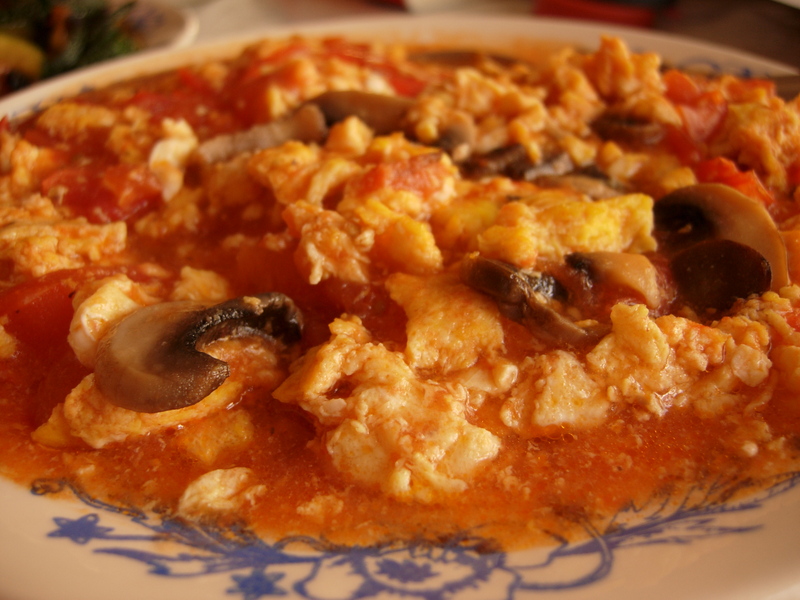 My mom also cooked one of my favorite Chinese comfort food dishes, which is eggs and tomatoes. I grew up eating this dish, and it was also the first one that I learned to cook myself. My grandparents used to cook it for me all the time because they knew how much I loved it. Everyone in my family makes it slightly different, which is exciting too. Today's eggs and tomatoes also had mushrooms added in for variety. The dish is tart overall from the tomatoes, which partially renders into a thin tomato sauce while it is cooking. But the eggs are seasoned and balance out the tartness of the tomatoes if you adjust the flavor of the sauce with a little sugar (the secret ingredient of Shanghainese cooking). I'll post a recipe of this dish sometime when I make it this summer. I will be cooking my own food now that school is out and the dining halls are closed. And you can bet on me making this dish! 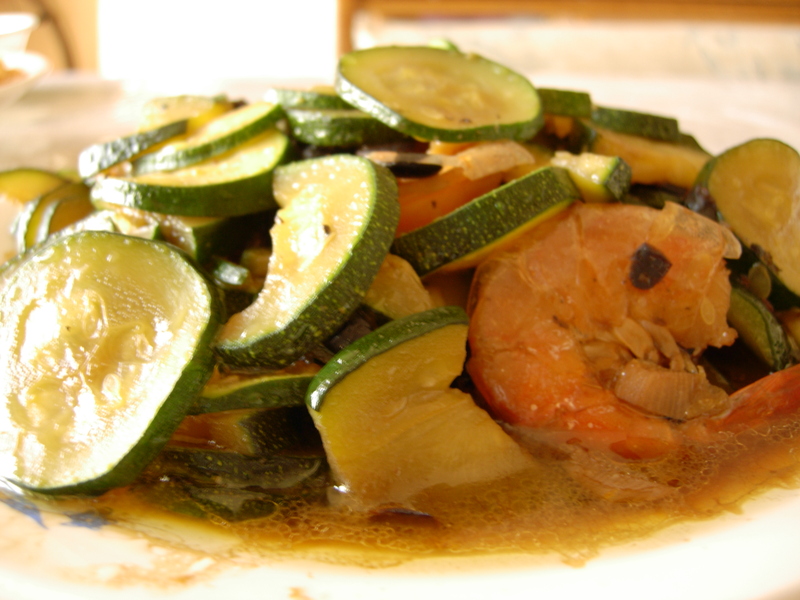 The other dish my mom made was zucchini with shrimp, which I think was basically tossing together two leftover dishes of zucchini and shrimp. I wasn't too excited about the shrimp because I hate having to peel shrimp shells, but it lent an interesting flavor to the zucchini I suppose. (5/31) The morning of my MCAT (which was to start at noon), my I woke up to find that my mom had left some steamed roast pork buns on the stove for me. To be honest I really wasn't in the mood to eat much that morning, I was having last minute jitters and just didn't feel too great. 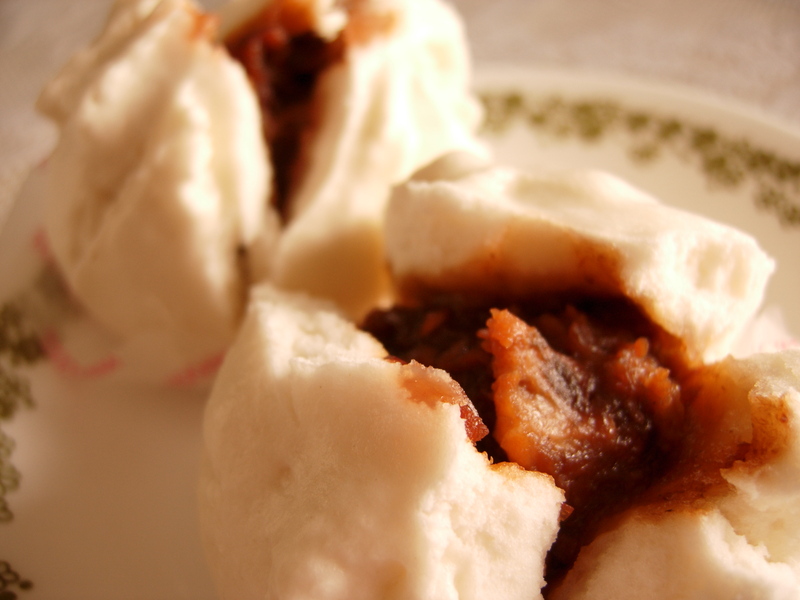 But these cha shao bao are usually pretty tasty, with soft fluffy bun dough on the outside (made with white flour and yeast) and filled with the red filling of roast pork. In case you were wondering, I thought the MCAT went okay this time around. I felt much more confident going into it and coming out. Of course, after I started reading a forum where people were discussing their thoughts on the test, I realized that everyone else thought it was really hard. I'm not sure if that's a good sign for me that I didn't think it was that bad. Either I'm forgetting all the questions I really had trouble with, or I picked the tempting answer traps for a lot of them, or I don't even know what. Let's hope for a good scale… too bad I won't know my score until July 3rd. (6/01) The day after my MCAT I finally had time to meet up with an old friend from high school, Reid. He and I are really close, and I love him so much. 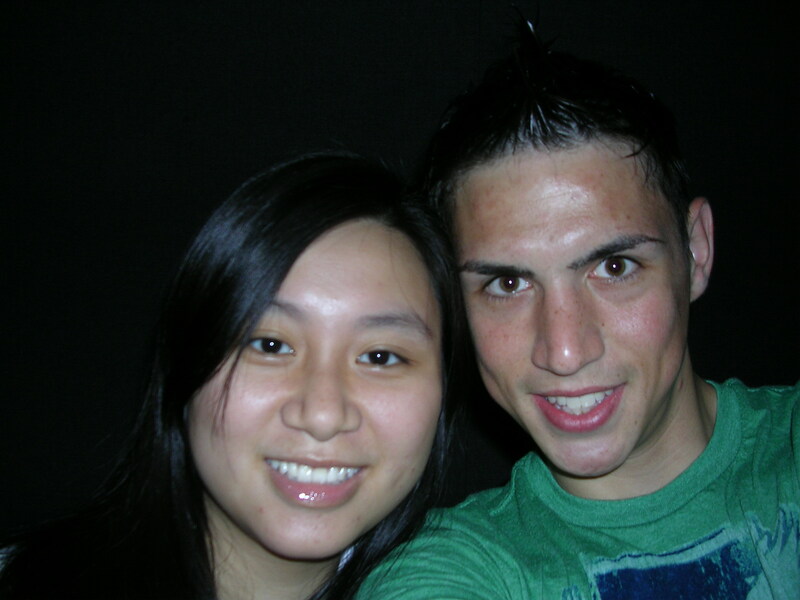 We met in my junior year of high school, when I switched to a magnet high school, and we became very close. After we parted ways for college, we rarely talked during semesters, but every time we were both back in town for the holidays and on break, we would always find time to see each other, and we always had a lot to talk about. It is so comfortable being with him, no matter how long we've been apart. There is never any awkwardness between us, and we share everything with one another. On this particular day, he had a lot to get off his chest about his recent breakup with his boyfriend of two years, and I really felt bad that he was so hurt by the breakup. I hope that our time together helped make him feel a little better. 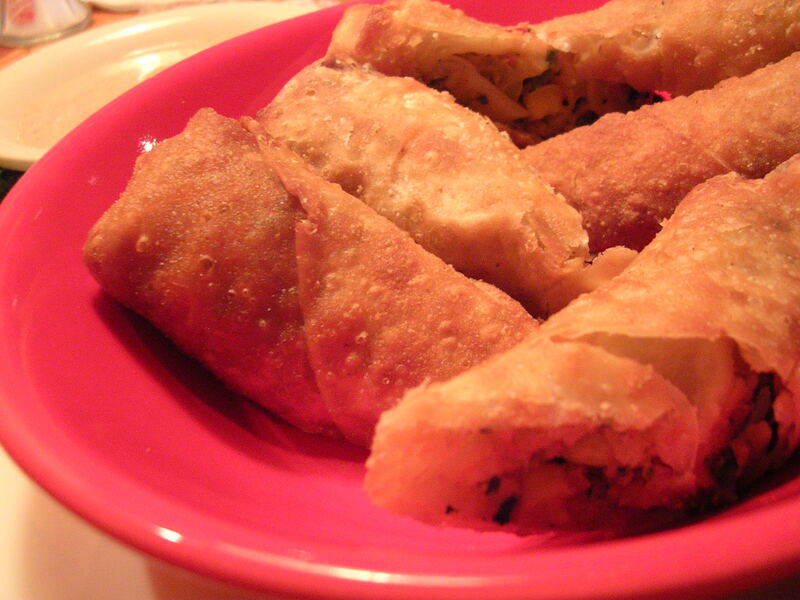 We went to Piccadilly Pub for lunch, where I got their Arizona egg rolls appetizer, which is like the firecracker chicken rolls I got before from Longhorn steakhouse, except these were filled with black beans, corn, some chicken, and other Tex-Mex-y items that I can't recall anymore. It came with a salsa ranch dip. After lunch Reid and I went to his house where I retrieved a shirt that I left with him 2 years ago (literally…haha) before we headed off to see a movie. We ended up seeing 28 Weeks Later, which was pretty good and made me jump a number of times. I always watch scary movies with Reid, even though we both freak out in the movie theaters and have to hold onto one another for dear life. I rarely ever watch scary movies with my boyfriend because he gets more scared than I do (shhh don't tell him I told you guys hehe). Here's Reid and I being bored as we were literally the only people in the theater on a random Friday early afternoon. That night my family was having a couple of guests over for dinner, and we were having lobster, which Reid kindly drove me to get before dropping me off at my house. He stuck around and had a glass of wine while he chatted it up with my mom (who LOVES him). Later when the guests came over we had a yummy meal of steamed lobster and spring rolls. Lobster is so tasty but such a mess to eat, it's something I definitely prefer to do in the privacy of my own home lol. We eat steamed lobster with drawn butter and a blend of soy sauce, vinegar, sugar, garlic, white pepper and scallions on the side. I think it's so weird that some people who are lobster-eating amateurs will literally take a whole lobster and only eat the meat in the claws and the tail, leaving behind all the wonderful meat in the body of the lobster. And then there are those people who seem terribly averse to the delicacy that is the green "stuff" in the lobster head that I'm pretty sure is the liver. It is my absolute favorite part of a lobster, as it holds the most unique flavor. I love living in Massachusetts, the lobster is fresh and meaty in this area, mostly shipped straight from the coasts of Maine. 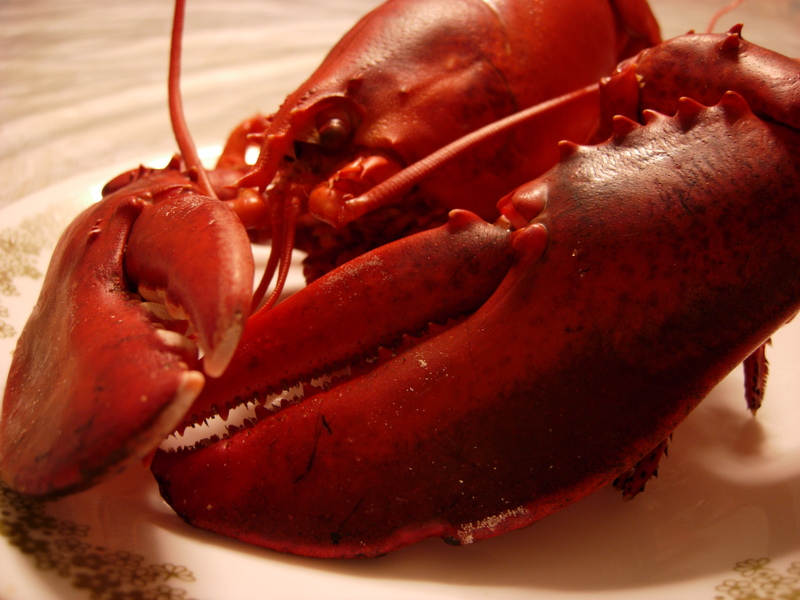 It's much cheaper to buy and eat lobster in New England, and I guarantee it's the best lobster in the whole country. This entry was posted on Monday, June 11th, 2007 at 4:38 am	and posted in Chinese, cooking, desserts, friends, fruit and nuts, restaurant, seafood, soups, Uncategorized. You can follow any responses to this entry through the RSS 2.0 feed.